You are invited, Sr. Highs! Join us for yet another $10 Prom. Get all dressed up and join us as we say goodbye for the summer in style! The point of this event is to find something FUNNY to wear. 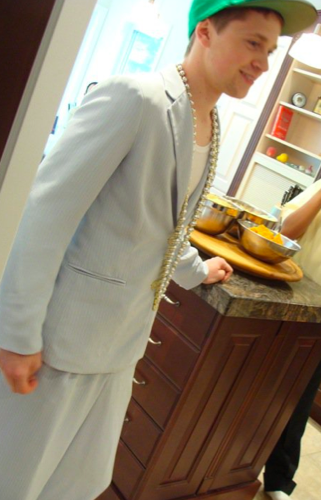 (For those of you who were there last year… remember Quinn in his gorgeous ladies pantsuit??) Last year we went a more formal route… but what fun is that?? We could have called this “80s Prom” but we don’t want to limit it to the 1980s. Be creative! * Raid the closet of someone you know. Was your aunt a bridesmaid in 1982? Bingo! * Check out your local thrift shop. I hear MCC’s Waterloo Generations is a great one!! 🙂 Why not buy an awesome outfit and do some good at the same time? * This time, it’s FINE to wear something you have worn before… but it better be awesome/funny! Or wear something you have worn before, but add some crazy accessories. * Guys, think crazy wigs, stick-on facial hair, bow ties, big glasses, bright colours… that kind of thing! 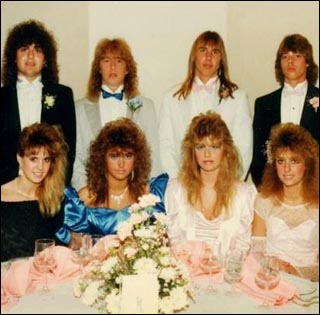 * Girls, think puffy sleeves, poofy dresses, teased hair, too much eyeshadow, crazy jewelery… ohmygosh! Clip-on earrings! We really (REALLY REALLY REALLY) want to encourage you to be creative and have fun with this! How great would it be if we came out of this with an epic group picture of everyone looking awesomely funny?